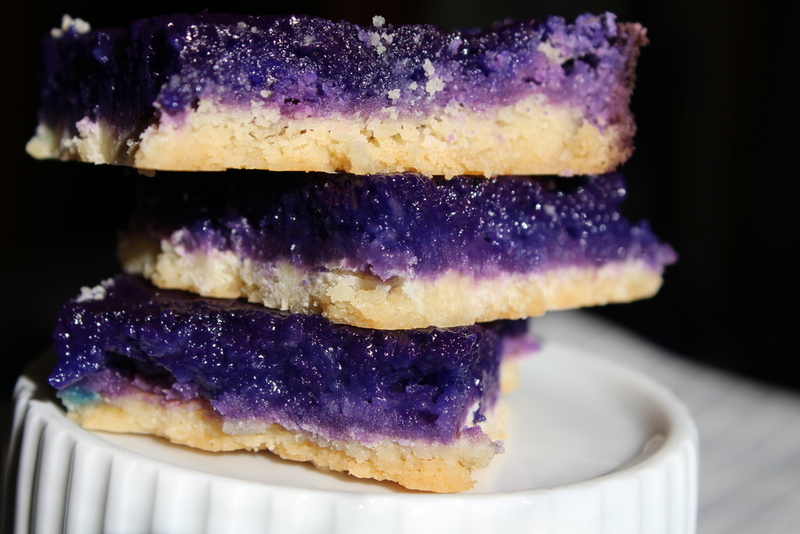 pie for lunch & purple grapefruit bars — Mel bakes things. I am a winter person. Brandon says I'm cold-blooded (in a lizard-y sense, not like a serial killer). In my brain, it is a scientific fact that you can always add more clothes to stay warm, but you can only remove so many articles of clothing to cool off before it becomes inappropriate and possibly offensive and/or illegal. I also get cranky when it's too hot. That said, for the first time since we've lived through Chicago winters, I'm actually ready for spring. I actually want spring to happen. Soon, please. I say this the day before we are supposed to get over 6 inches of snow. We got a small taste of spring this weekend. Sunday, it was a whopping 43 degrees and sunny! I know, I'm sure you're gasping in awe. I certainly was. We went out to Logan Square to visit a farmer's market/craft fair, where we bought bread for dinner and ate cream puffs for breakfast (coconut banana nutella and chocolate caramel stout...both delicious!). Even better, though, was lunch. 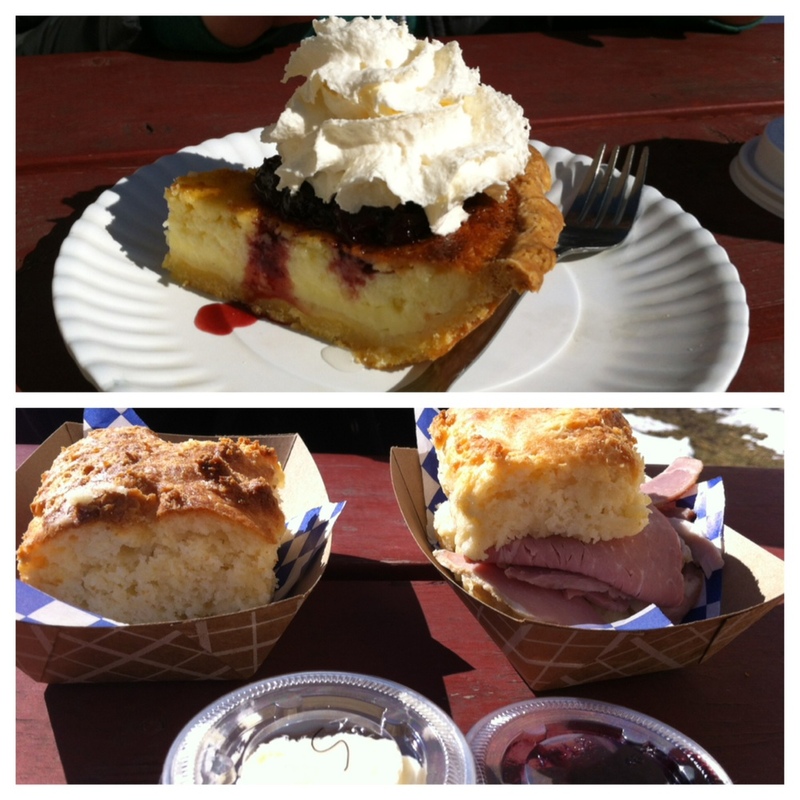 We had pie and biscuits for lunch from Bang Bang Pie Shop. PIE. BISCUITS. These should be lunchtime staples everywhere. Perhaps I will run for president and pie for lunch will be my platform. Anyway, the cherry buttermilk pie was to die for. Tart, sweet, crispy crust...everything you want in a pie. But I actually think their biscuits were even more outstanding than the pie. I don't even have words for how good they were. You can get it with ham (they use locally smoked ham), or plain and choose from a selection of their homemade seasonal jams and butters. The shop is super cute, albeit super steamy from all the cooking happening in the back, but they also have a few picnic tables set up out back and it was just warm enough to enjoy the deliciousness outside with a hot cup of coffee. If you're a Chicagoan (or even if you're just visiting for a few days), go check these guys out. They really know what they're doing. Remember a while back when I shared a kitchen fail with you? Well, this is like a half-fail. I had great expectations when I decided to try to adapt my Grandma's lemon bar recipe into some other kind of citrus bar. I have a fierce love of lemon bars, and I wanted to see if they'd adapt well to blood oranges. Nope. Fail. They weren't gross, just boring. Also, they were a weird eggy pale color. Not cute. So then, I decided to try them with grapefruit, since it has a much stronger taste. And because it was still going to turn that weird eggy pale color, I decided to add a bit of gel food coloring. I was going to go with pink, because, you know, grapefruits and pink make sense. And then Brandon said I should dye them purple (...has anyone listened to that Aziz Ansari bit about 50 cent and the grapefruit soda?). And then purple grapefruit bars were born. Again, they're not gross. Weird, yes. Gross, no. They just don't stand out the same way lemon bars do. Stick with lemon. Mix flour, butter, and powdered sugar thoroughly. I've done this in both a food processor and a stand mixer -- both worked just fine. Press evenly in an 8x8 pan. Bake 15-20 minutes, until slightly golden around the edges. Beat eggs, sugar, baking powder, salt, juice, and zest together. Again, mixer or food processor is fine here. Pour over crust and bake 20-25 minutes until set. If you're worried about it getting a bit brown on top, cover with foil while you bake.